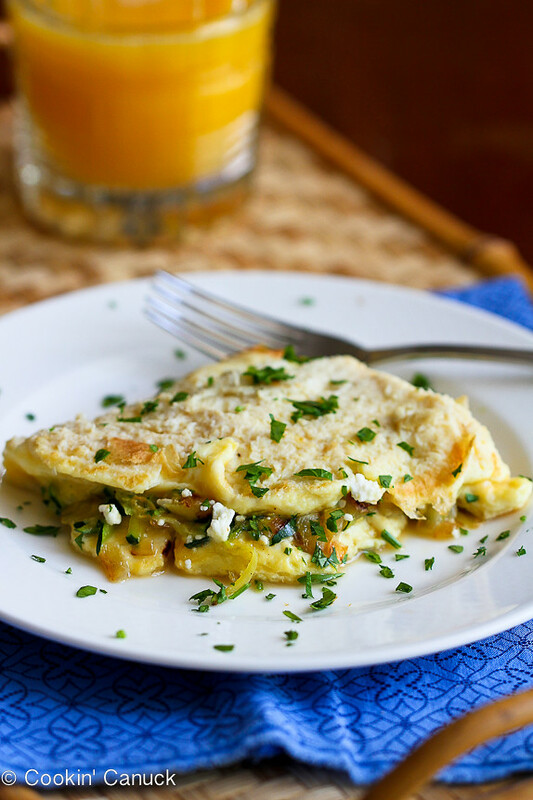 This vegetarian omelet packs in a ton of flavor and is ready in less than 20 minutes. 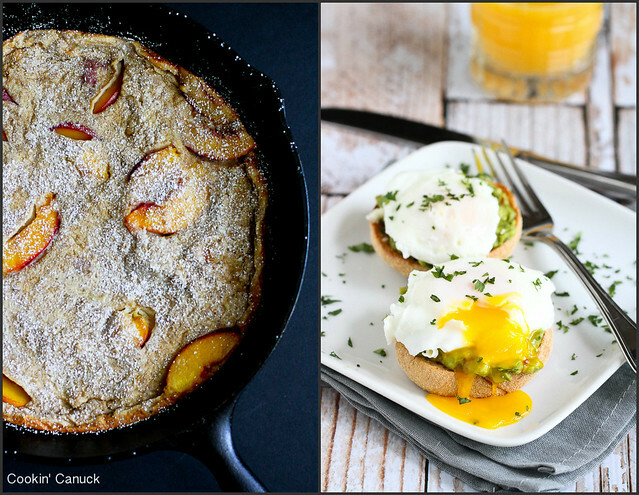 It’s perfect for brunch or a quick, healthy dinner. My 10-year old son (T) is on a culinary mission. He wants to make the perfect omelet. Quite honestly, as long as it involves a hiatus from Nerf guns and potty talk, I’m thrilled! Once a day, either at breakfast or after school, he pulls out the nonstick skillet, cracks a couple of eggs and sets up his mise en place. Yes, mise en place. Hey, if he’s going to make the perfect omelet, he might as well talk the talk! Actually, the mise en place (organizing and arranging the ingredients) is key when making an omelet because everything moves at a breakneck pace. As I mentioned in my step-by-step photo tutorial, How to: Make an Omelet, the heat should be set at medium-high. You’ll be adding your omelet fillers before you can blink ten times. There’s no messing around here! After all my talk of How to: Caramelize Onions the other day, I really couldn’t think of anything but golden, sweet onions. I didn’t go as far as caramelizing the onions for the omelet, but they took on just enough sweetness in a few minutes of sautéing to satisfy to my craving. If you prefer to dice the zucchini, go for it. It was lunchtime and I was hungry, so grated zucchini seemed like the way to go because it took about two minutes to tenderize in the pan. An omelet just never seems complete without a little cheese. When you’re using a cheese with a strong flavor, like feta, you can get away with using just a little. One tablespoon did the trick for this two-person omelet. This omelet hit the spot, but I must admit that I’m looking forward to be treated to one of T’s omelets very soon. Heat the olive oil in a medium nonstick skillet set over medium heat. Add the onion and cook, stirring occasionally, until the onions are starting to brown, about 4 minutes. 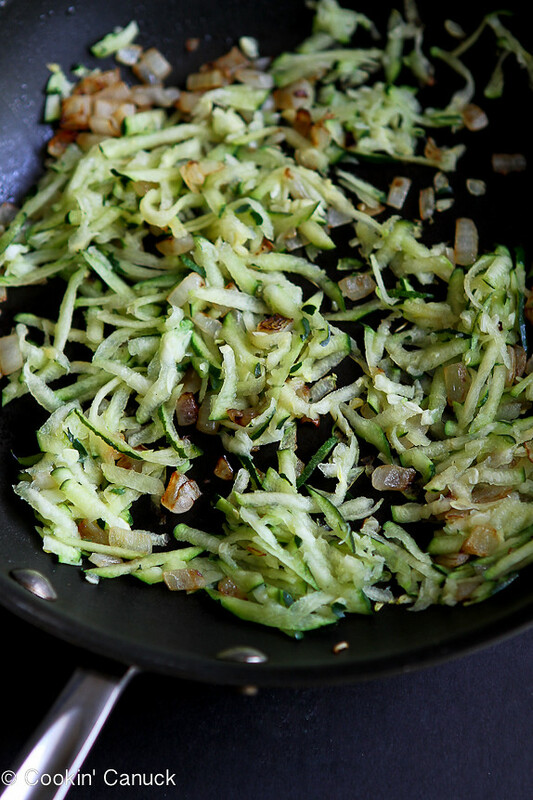 Add the grated zucchini and cook for 2 minutes. Transfer the vegetables to a plate and cover with foil to keep warm. In a medium bowl, whisk together the eggs, egg whites and water until combined. Wipe out the skillet, coat with cooking spray and increase the heat to medium-high. Add the eggs to the skillet and cook until the edges begin to set. Gently lift the edge of the omelet with a spatula and tilt the pan to allow the uncooked egg mixture to run into the bottom of the pan. Continue to do this as the omelet cooks. Cook until the center is set. Season with salt and pepper. 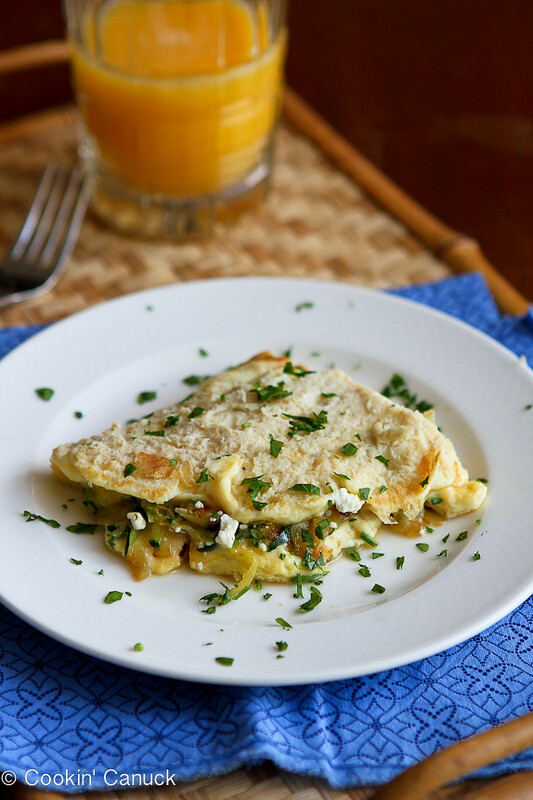 Spoon the vegetable mixture onto half of the omelet and top with the feta cheese. With a spatula, loosen the omelet from the pan and fold it in half. 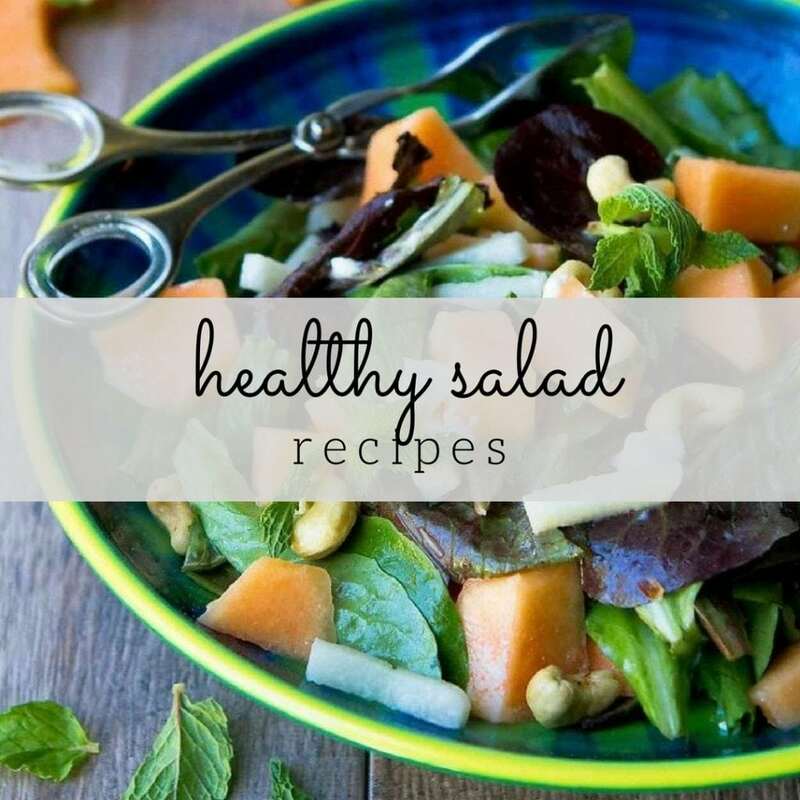 Slide it onto a cutting board. 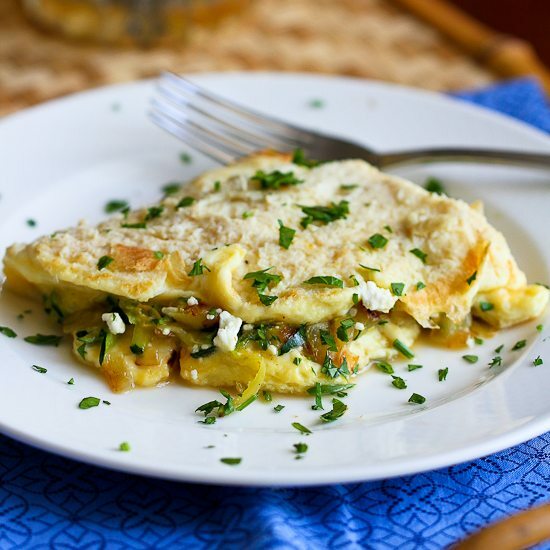 Cut the omelet in half and serve, garnishing with parsley. Loving this healthy breakfast Dara!! Thanks, Marla! We will be making this on a very regular basis. I want to wake up to this omelet! Yum! Thanks, Sommer. Yeah, I’m hoping T will take on this omelet for a Mother’s Day breakfast in bed. Thanks, Ali. Oh yes, and we have plenty of zucchini to be used. Sounded so good I had to make this for breakfast today!! It was DELISH, thanks for the good recipe! You work fast, Susan! 🙂 I’m so glad that you enjoyed it. 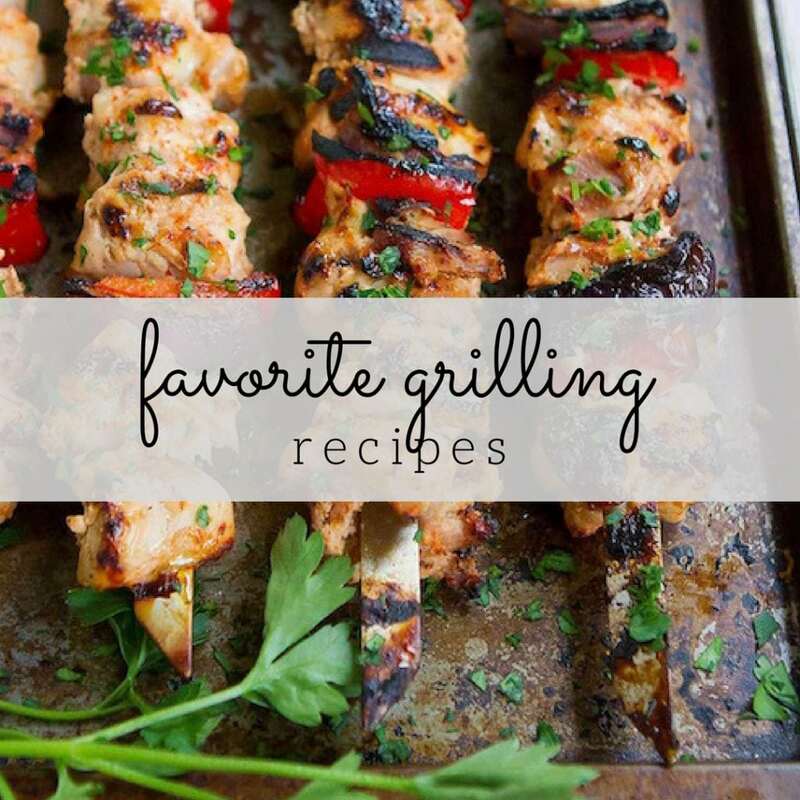 Yummm — I love this flavour combination – such a great idea!! Your son can try out all kinds of omelets at my house. I can’t get enough of them. 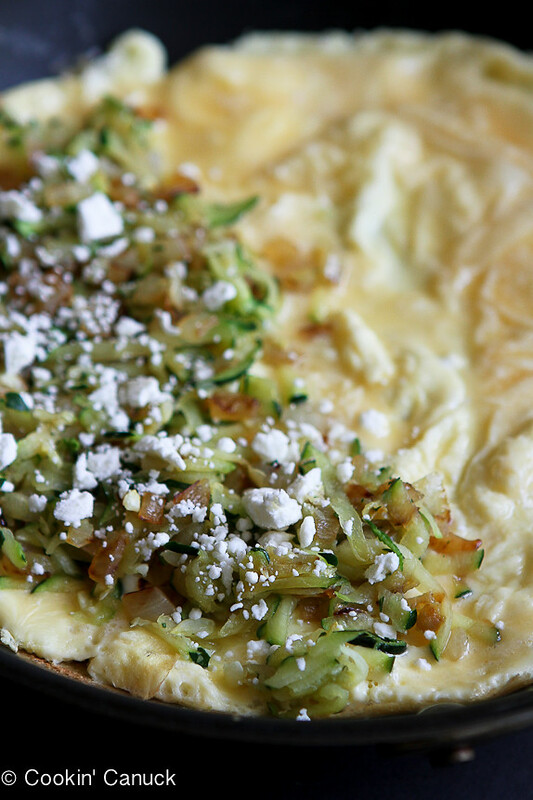 A great combination of flavors in this omelet. I can’t wait to make this. 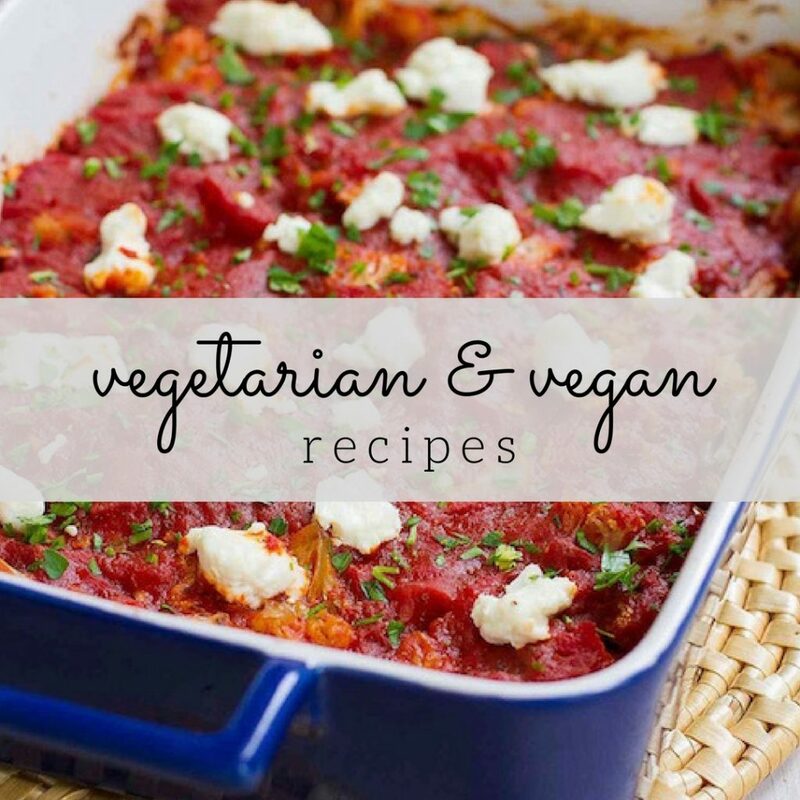 I made a version of these, never thought about using Feta, it was delicious. This would be the perfect dinner for one when my husband is away. I think I have zucchini-ed him out!